October really threw me for a loop this year. I was completely swamped with all sorts of things. Life is busy already, but when you throw in three family birthdays, my in-law's 50 wedding anniversary including a trip to Vail, an out of state marathon, and other family events, oh yeah, and Halloween.... I just had to take a short blogging break and focus on what was most important. I am seriously in love, and the funny thing? I don't even like Coca-cola, or any soda for that matter. But it is such an American icon, I couldn't help myself. I am not keeping this crate, I gave it to a dear friend as a gift. I love crates with flowers you can see Here, Here, Here, Here, Here, Here, and Here. Wow, I didn't realize I had made so many...I guess I really do love these, they make such a great gifts. Cute and useful. I wasn't planning on doing a tutorial for this, because I have done so many crates, so I didn't take photos of the build, but in the end I decided to share anyway. Sorry. 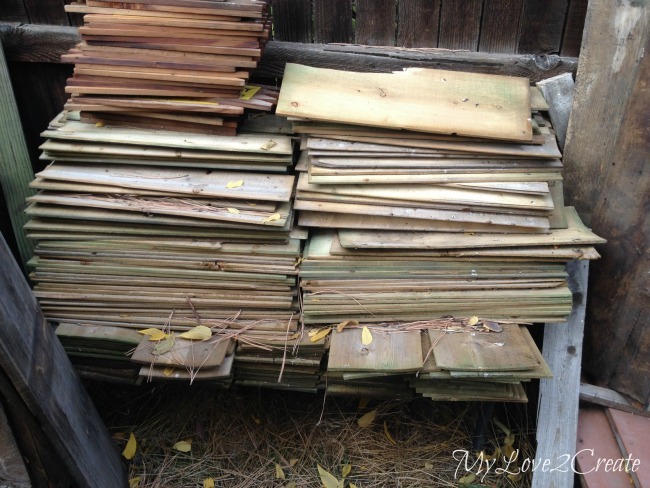 I made it very similar to these crates and the process is the same except the size of the wood and I added the cross dividers, so you could use that tutorial. 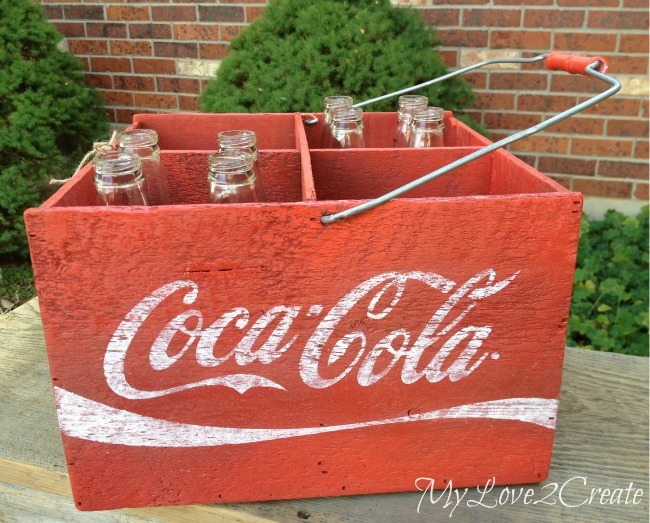 Or, Ana White has a great Soda crate caddy plan that is basically the same. Hope that helps. Anyway, while I was building I kept thinking of the handles and how I wanted to do them. I find it fun and challenging to think of new options for handles. Then I remembered my lamp shade basket and how I did the handles on that... I had to slap my head, hello?! It was so obvious. I ran and grabbed an empty laundry soap container (yes I save them...to keep toys organized) and used a knife to cut the plastic, so I could yank out the wire handle with some pliers. Awwwesome. With some shimmying and bending of the handle I was able to get the wire handles into the holes, then I bent it back to how it was supposed to be. I covered the wire with painters tape and used left over spray paint to first paint the crate brown and then top it off with red. Hooray for left over spray paint! I used red because that is my friends favorite color. I had no idea when I started this that I would end up doing the coca-cola symbol. That just seemed like the ONLY option coming to my head, really, it was meant to be...so I went for it. 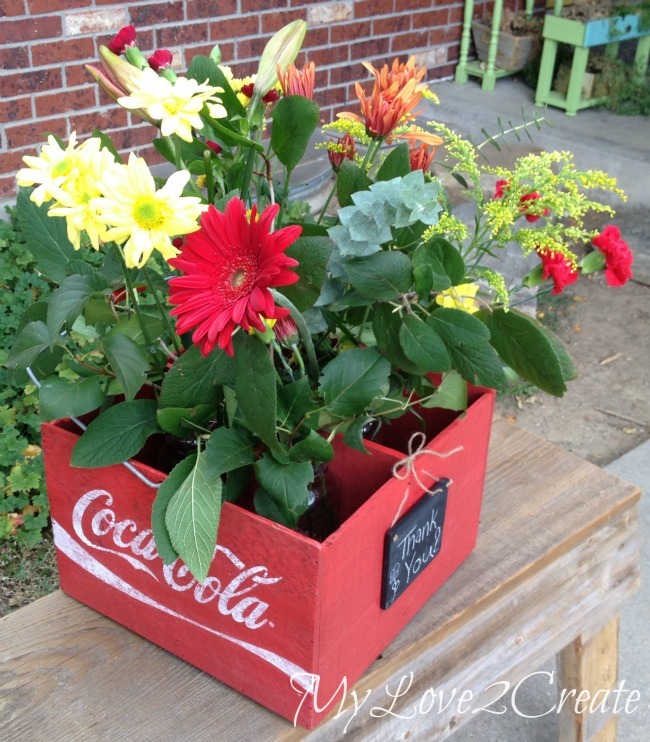 I mean, old soda crates are super cool. 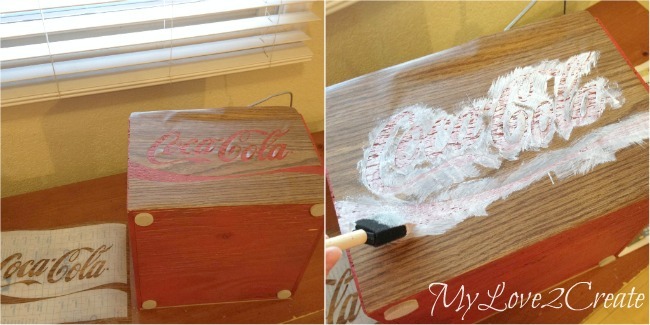 I found an image of the coca-cola symbol and converted it to an SVG file using a free online converter, (just google it) and then cut it out on contact paper to make a stencil using my cricut. I cut two so I could put the symbol on opposite sides of the crate. Then with hardly any paint on my brush I lightly filled in the stencil. With a quick sanding (400 grit) I was done. Totally fun! And how about that handle?! It makes it even more authentic, and looks so cute. I added a chalkboard label that I made from a scrap of wood and chalkboard paint. 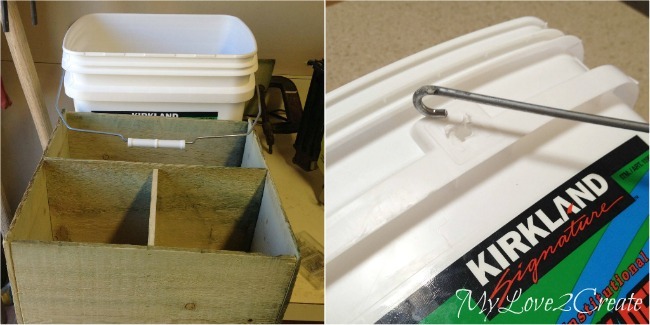 Drill some holes, add some twine and you have an instant sign. 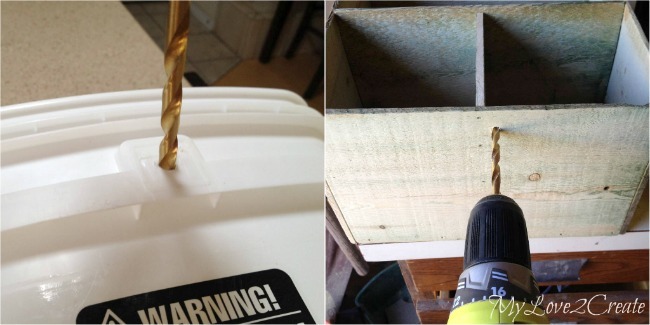 The holes in the crate that the twine are going through are the ones that were too low down for the handle, so I added another one to make two holes, perfect for tying things to the crate.... great way to cover my mistake don'tcha think? I always gravitate to the color blue, so it was fun that my friend loves red. I think I may have to be a little more bold in my color choices for the future, because this color is speaking to me. It is so bright and cheerful! 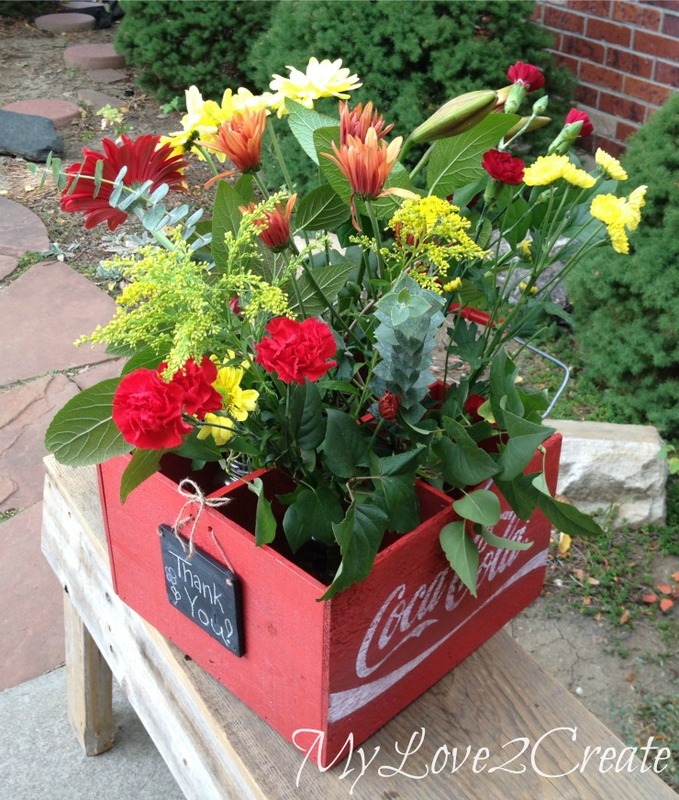 I love how this gift crate morphed into a fun Coca-Cola Crate. 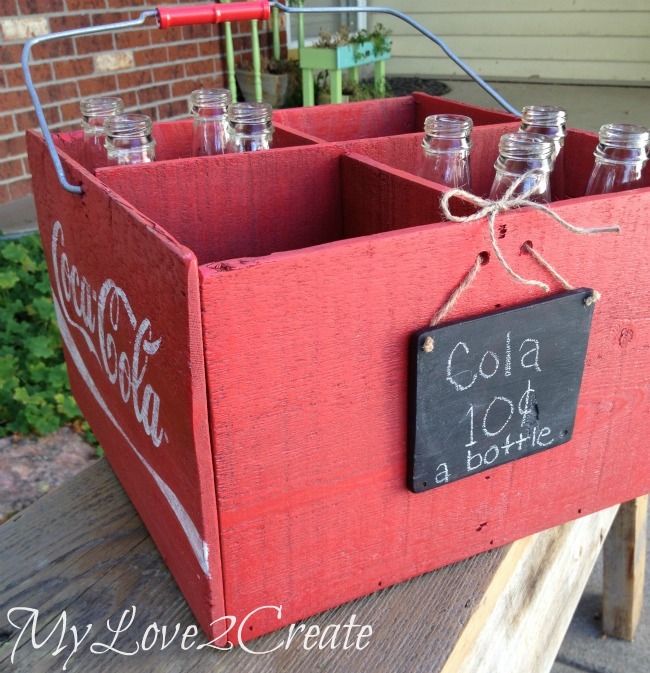 Just imagine, you could re-create any type of soda crate you wanted! My husband said I should do a blue one with the Pepsi symbol. Maybe I will! Do you like to use crates in your home? 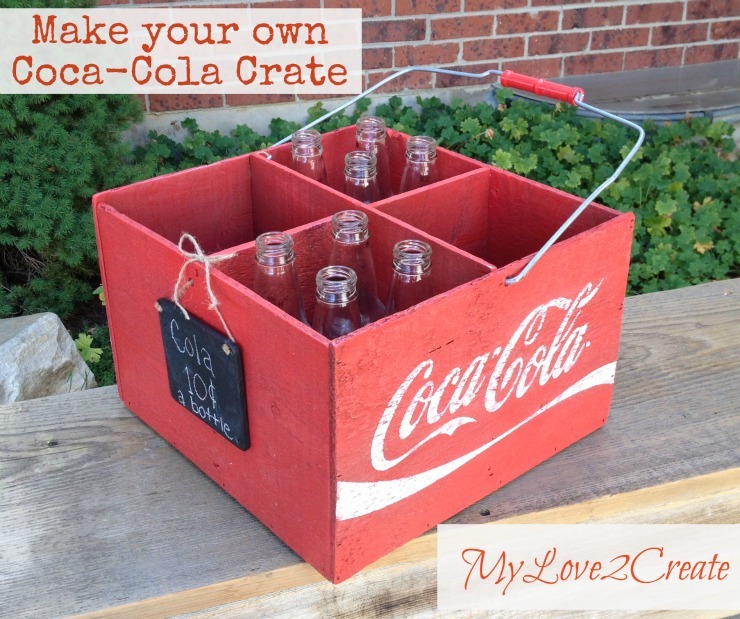 I would love to know your great ideas, any excuse for me to make another crate! Well I pinned it. And I got an idea from it too. Quit inspiring me, it's hard on my husband to keep up. 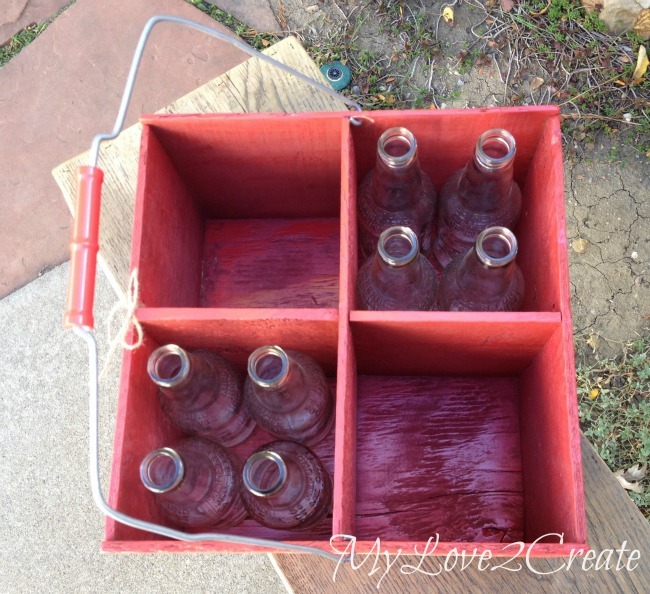 super job, LOVE the repurposed laundry handle for the DIY soda crate. Super cute project! 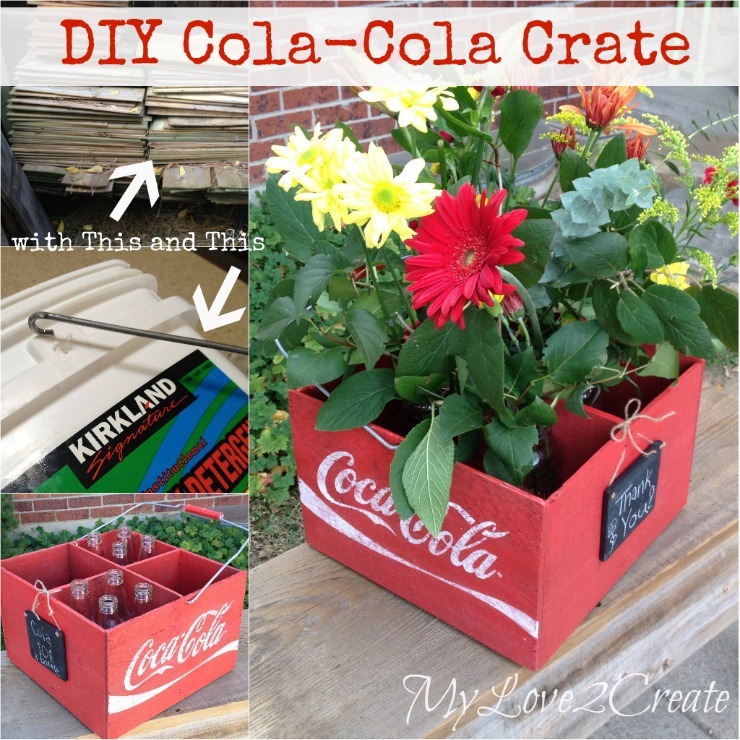 How could one not love a Coca Cola crate. Thanks for linking it up to the VIP party. This is way cute - LOVE it with the flowers inside! You should totally make one for you, too!! Great job...I thought it was an old piece given a new life.....but nope! Awesome. I am truly in love with this project! there is no doubt that this will be in my Bucket list for projects to do. 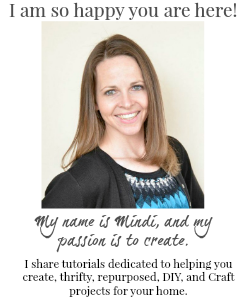 Hello Mindi, I'm visiting from Kris' blog. I love all of your thrifty projects! 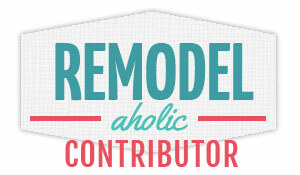 I'm looking forward to hanging out here and getting tons of great ideas. I'm definitely a follower! Enjoy your day. Thanks Mindi for doing Spotlight this morning. It has been so much fun to let bloggers get to know you better. Love this project so adorable. So glad that you were featured by Kris. Isn't she the best? I looooove your blog and don't know how I've never found you. You are awesome! The kiddos are adorable! I look forward to seeing what you create. I know I'm going 2love! Dang cute Mindi! I love the red coca cola crates. What a great knock-off! Thank you for sharing at What We Accomplished Wednesdays. Have a great weekend! You are so talented! Love this! Thanks so much for linking! Hey there! I've featured your crate at Worthwhile Wednesdays tonight! This is so cute Mindi! I love how you used the handle from the bucket. I love Diet Coke way too much! lol! I bet your friend loved it. So cute filled with flowers! So happy to have you share with Share Your Cup. What a great idea for the handle. You rock!